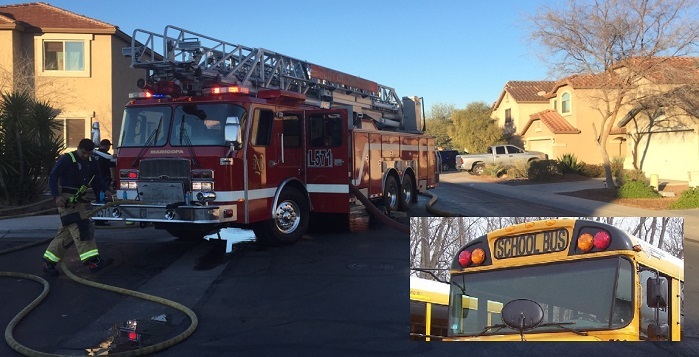 Maricopa Fire Department stopped a kitchen fire Monday morning (photo courtesy MFD) while an MUSD bus driver was unknowingly helping out one of the firefighters. A kitchen fire in Rancho El Dorado Monday morning led to a series of events that left a firefighter profusely thanking a local bus driver. The call came in for a fire at a home near the corner of Davis Way and Hillman Drive. One of the responding units came out of Fire Station 572 in Tortosa. That was where firefighter James Huerta laid aside his wallet and keys during the response. The fire itself was a smoky affair contained to the kitchen. Residents and pets were all accounted for as Maricopa Fire Department took over the scene. Huerta’s wallet, however, was on a journey of its own. Left on a vehicle that went into action, the wallet flew into the roadway during the response to the fire, scattering contents near the crossroads of Bowlin Road and Hartman. Huerta was horrified to realize what had happened. His wallet secretly contained more than $400 he was saving to buy his wife Beth a ring for their 20th wedding anniversary. “Jimmy said he found a couple of ones and a couple of fives, but everything else was gone,” Beth Huerta said. However, MFD dispatch received a call from Maricopa Unified School District’s dispatch. During her route that morning, bus driver Maureen Tobin saw the wallet and its contents scattered on the pavement. “I told Amy, ‘There’s money on the street,’” Tobin said. Amy Kowalski is Tobin’s bus monitor. While Tobin stayed on the bus with one passenger, Kowalski retrieved the wallet and the money. “I just knew I would be so heartsick if that happened to me,” Tobin said. 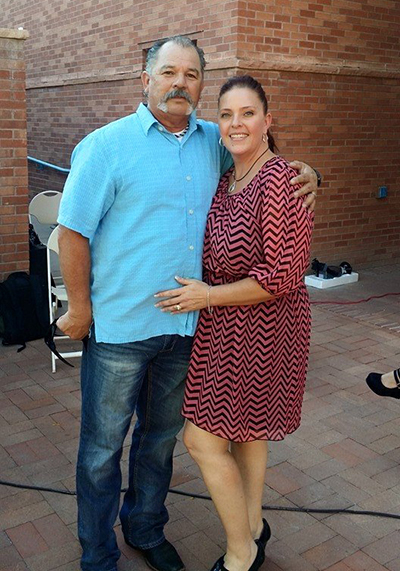 They sealed the wallet in an envelope and turned it into MUSD Transportation Director Fred Laguna. “That was nice to know that someone would be that honest,” Laguna said of Tobin, who has been with the district since 2012. Laguna said he locked it away after they identified the owner through EMT information and made sure MFD had been contacted. It’s not the first time Tobin has been in that situation. Once on vacation, she stepped on a lost engagement ring at a swimming pool, was able to find out the owner and mail it back to her. After leaving a golf course in northern Michigan, she and her husband saw a wallet in the road and picked it up. Using a letter in the wallet, they were able to track down the owner. She said it’s sad people consider returning lost property to be extraordinary. She said keeping Huerta’s wallet had not occurred to her or Kowalski. Beth Huerta said she intends to give Tobin a reward.